The openers are the first piece of the puzzle for the Australian selectors. During the recent Test series against India, Australia utilised three openers: Marcus Harris, Usman Khawaja and Aaron Finch. Of these three only one opener stood out in the series being the likes of Harris while Khawaja scored a hard-made 27 after Indian keeper Pant dropped an easy catch which would’ve seen him walk for a duck. 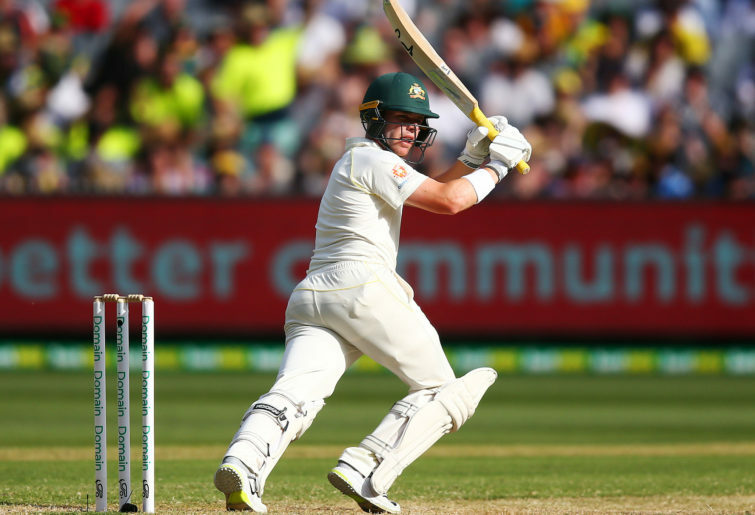 The Queenslander, however, averages over 100 in the opening spot and can still be considered in the opening spot should Marnus Labuschagne stay at three. Finch had nothing to back his name up this series with an average of 16.16. 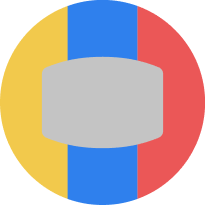 Alternative names for the opening position include the Queensland duo Matthew Renshaw and Joe Burns. However, when looking at the statistics of the current Shield season, it becomes abundantly clear that neither of these players are suitable for a spot in the nation’s best XI. Burns has an average in the opening position this shield season (with a minimum of four innings) of 37.2 with three Shield fifties in 12 innings. His partner, Renshaw, has had a worse run this summer with an average of 19.9 in ten innings with only one minor milestone to his name. So, who is in the running for the first Test against Sri Lanka later this month? Well the best two qualified players are the two New South Welshman Daniel Hughes and Nick Larkin. This partnership has opened all 11 innings this season for NSW, with both averaging in the mid 50s, the highest averages by an opener this series behind the young Test player, Marcus Harris (83.5). 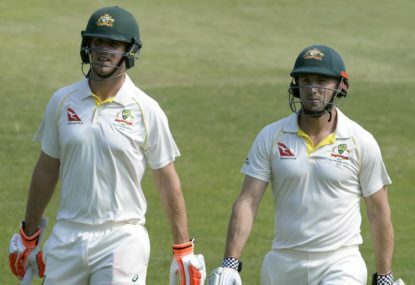 Hughes has the higher average of 56.89 with two centuries and two fifties, while his partner averages 54.89 with two centuries and one fifty to his name. 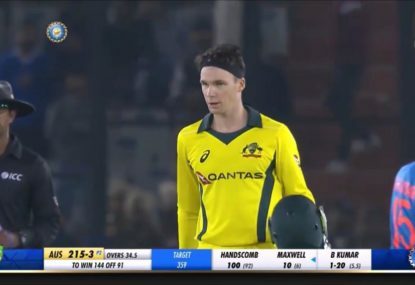 The number three spot, normally owned by Khawaja, was also shared with Marnus Labuschagne, who hit a well made 38 before being caught out by a sharp catch taken by Rahane. 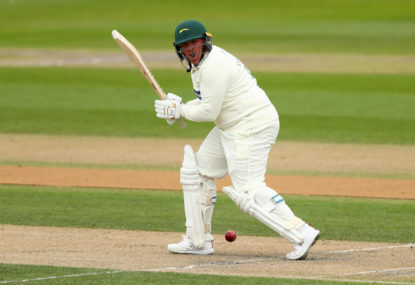 Although Marnus has a strong case, players such as Kurtis Patterson, with an average of 48, and Will Pucovski with an average of 103.67 including a 243 on his first-class debut and a 67 from his second game. The only problem with the young Victorian is that he has only played two state-level games and is still considered too young to play at an international level. Patterson has had a lengthy FC career and this season has scored one century, three fifties and two forties making a strong case for the top order. The middle order is the hardest place on the selector’s minds with only one of the spots locked down by Travis Head, the only Australian to score more than 200 runs against India this series. This is where the Australian fans have the most to say about the selector’s choices for spots in the team. 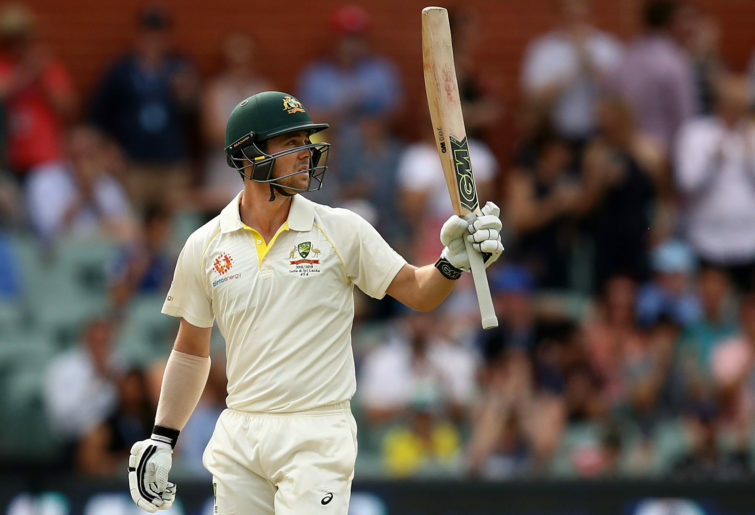 The easy players to exclude are Mitchell Marsh and Peter Handscomb who unfortunately became trapped in front too easily by India, and England during last summer’s Ashes series. 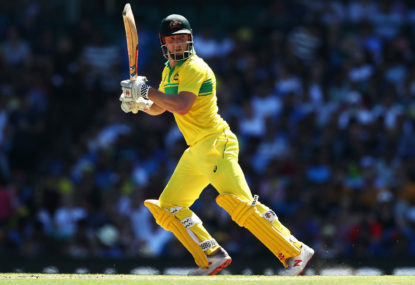 Although Shaun Marsh hasn’t made runs, he does average 88.6 in the three games he’s played for Western Australia and had the fourth highest average for Australia against India. When thinking of players to add in Australia’s middle order, the first name to mind is Glenn Maxwell, he has scored a Test ton in his previous Test matches and he has been making shield runs. Or has he? In the two shield matches Maxwell has played, he has scored one fifty, two thirties and a duck since coming back from the T20i series against India. Other names that appear everywhere in discussion is Marcus Stoinis and Matthew Wade. Matthew Wade has got all the numbers to lock himself a spot in the Australian team as the current shield top scorer with 571 runs at an average of 63.4 from 12 innings with five fifties, one century, two forties and three not outs batting at six for Tasmania. 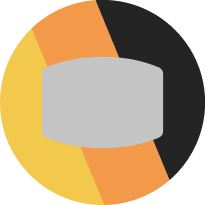 Marcus Stoinis is another player who is hard to look past with a batting average of 42.57 including three handy 50’s from his seven innings when batting at 5. But not only does Stoinis perform with the bat, he is also the desired fast-bowling allrounder that the selectors have been desperately trying to get from Mitch Marsh, and have proven useful for Australia in the short forms of the game. With 80 overs under his belt he has taken ten wickets and bowed 21 maidens at an average of 25.2, going for 3.15 an over. Alex Carey also deserves a mention, batting at seven in the two games he has played for South Australia, he has hit one not out century at an average of 75 however, with Tim Paine as the captain, it is very unlikely he will be picked in the long form. 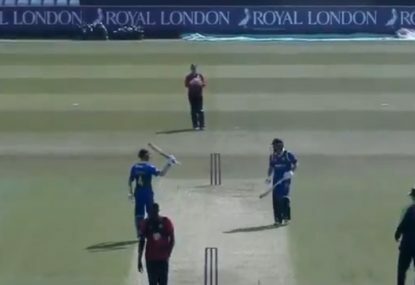 Another player worth mentioning is the former Australian coaches’ son, Jake Lehmann, averaging 59.2 when batting at 4. The bowling cartel of Cummins, Starc, Hazlewood and Lyon have worked for a long time and although many consider Starc and Hazlewood to of “lost their groove” recently, the bowlers have had very batsman friendly conditions to bowl on in the past few months. The Test series in the UAE was flat and produced very little movement which was expected and in the series versus India, the pair were forced to bowl first on three of the flatTest wickets Australia has seen in its history. The first Test against Sri Lanka will be a day-night Test at the Gabba and will require a great swing bowler. Mitchell Starc is well known for his dangerous bowling with the new ball and his ability to reverse swing the ball which will come in handy in the night sessions. 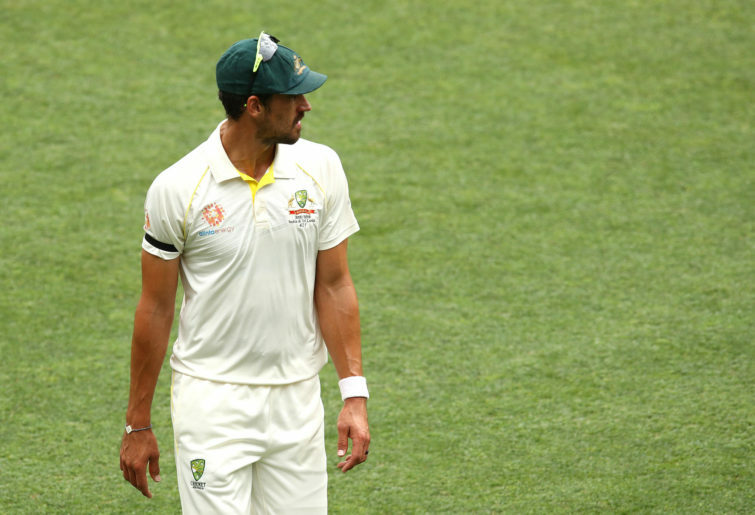 The only bowler who should be worried about their spot is Josh Hazlewood who is more of the Glenn McGrath style bowler as apposed to the brute pace approach that Starc and Cummins use. However, if another option is required, Chadd Sayers is the pick. With plenty of swing he will definitely suit the Gabba in a day night Test match.